Curious silence envelops this fort perpetually. It feels as if the 700 years old curse still shrouds this mammoth structure. 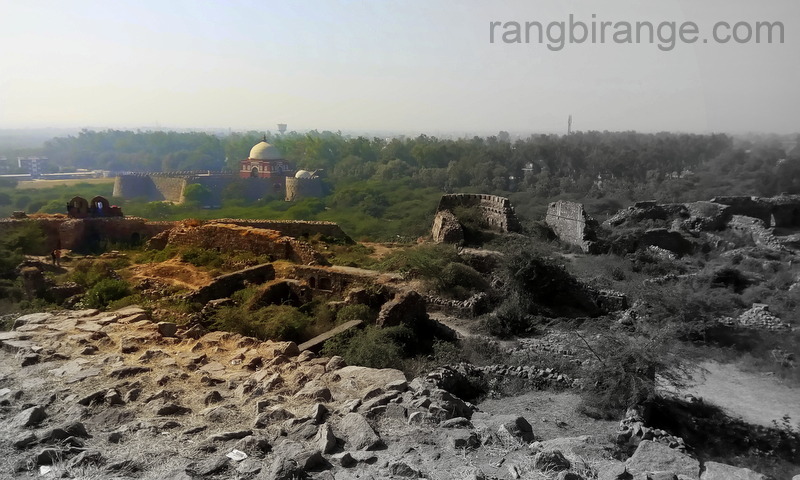 One weekend I set foot on the ramparts of this medieval fort, which was the seat of power of the 3rd city of Delhi, named Tughlaqabad. Delhi of course was ravaged & built 7 times over the centuries by different dynasties. When the warm winter sun shone on it, reaching every corner, it seemed to have come alive, opening its arms to welcome rare visitors (I went with one of the ‘city walks’ groups). Broken, strewn stones and sloping walls are testimony to unfulfilled fancies of its builders. Uncommon birds and occasional Sambhar deer are spotted in the huge and unwanted patch of vilayati kikar (invasive species of acacia). Still air curbed inside underground passageways infested with bats and rodents send a chill down the spine. But then the idea that the adjacent rooms were used by inhabitants to keep cool during unbearable summers makes one reflect about eco-friendly ways of the past. 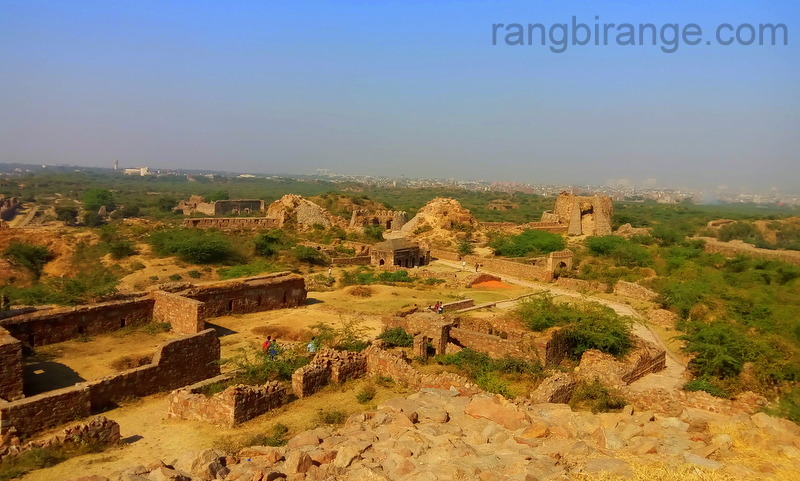 Hemmed from all sides by tall bastions, this irregular shaped fort built by Ghiyasuddin Tughlaq in 1321, must have been a vision once. He was of Turkish ancestry, as his father was a Turkish slave and mother was an Indian. 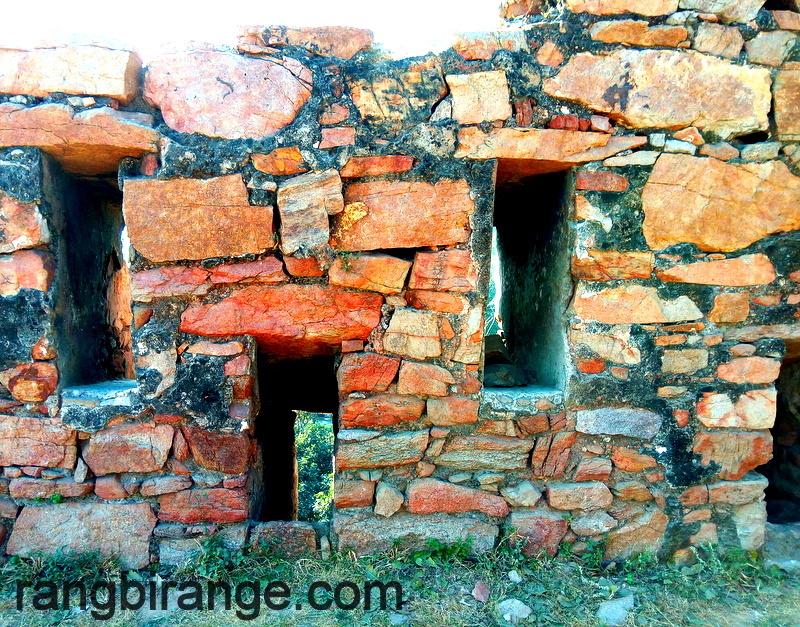 Various structures made by Tughlaqs, this fort for example, are considered by some historians to be rough and bare as compared to the ones built by Hindu or Mughal rulers. As I entered the enormous arched gate, deserted ruins met me as far as the eyes could see. 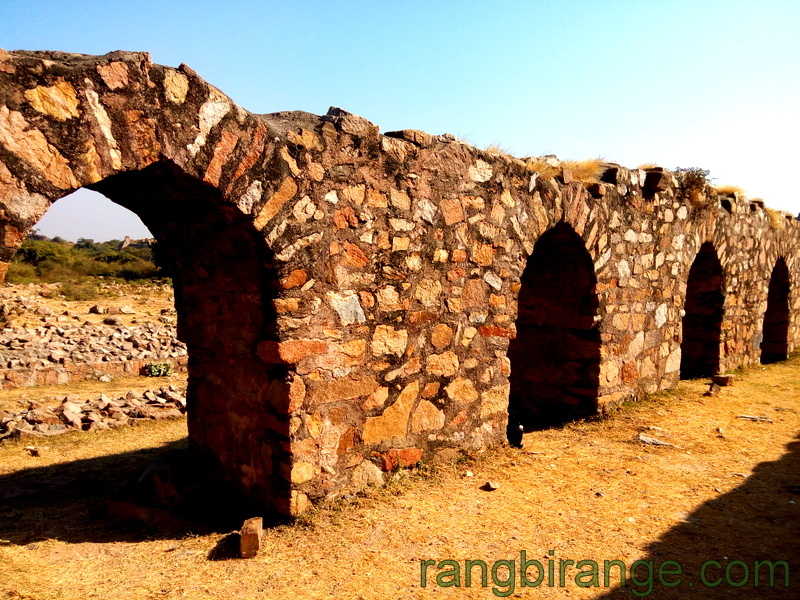 It is evident from the architecture of Tughlaqabad Fort that the emphasis was on enormity and safety but not on design or the material used. That seems true in the light of the fact that it was built keeping in mind constant threat from Mongol invasion. Taking high stone stairs to reach one of the ramparts I felt being transported to the world of Tughlaqs. The earth – most of it covered with kikar, is dry and unyielding – it’s not difficult to imagine that it drove away the citizens as there always was dearth of water. 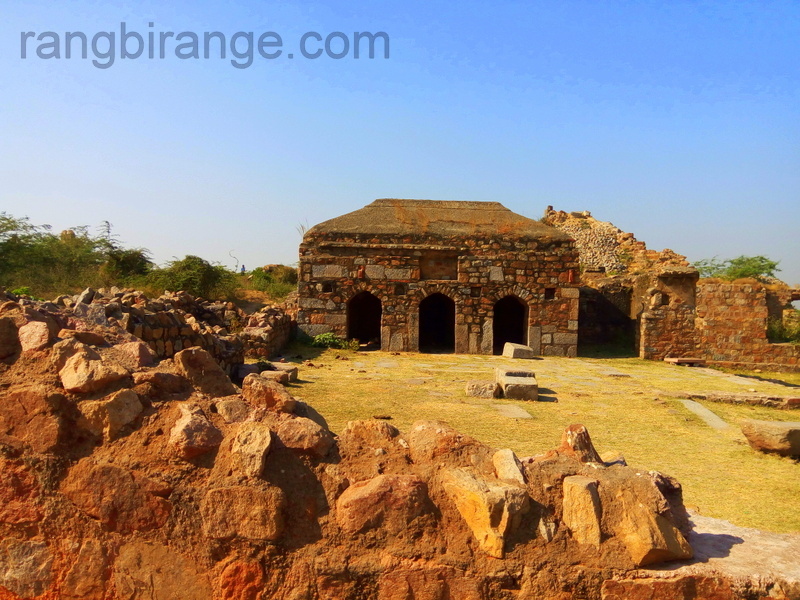 Ghiyasuddin who started the Tughlaq Dynasty reigned only four years (1321-25). Apparently he wasn’t satisfied with the low walls of the then Old Delhi and hence built his new city in and around this fort. It’s believed that he picked this spot because of a rocky hill and rough surrounding terrain. This place was about 7km to the east wall of Old Delhi. The fort with its remaining bastions and ramparts still has a grand air about it, even as most of it has been destroyed over the centuries. Masonry is plain with no carvings but it made use of massive stones, some believed to be weighing as much as 5 tonne each. At many places, cyclopean lintels could be seen. We posed for photos beside the niches from which spears could be thrown at enemies! Bits and pieces of this crumbling and almost forgotten history are lying in the narrow lanes of nearby Tughlakabad Village. Our guide told us how the residents of nearby villages have been taking away big and small rocks, even engraved ones from the fort. Enroute the short distance we met goats merrily eating grass from the uneven ground of the neglected fort. Soon the owner — a woman with a fat stick came out of a depression behind the bushes and at once the alleged curse rang in my head — “Ya rahey ujjar, ya basey gujjar” (either remain desolate or be inhabited by gujjars [nomad tribe])! Nizamuddin Aulia, who is considered a revered saint now, was the one who cursed the fort and according to Ibn Batuta (who travelled to Tughlaqabad during the reign), was an accomplice to Muhammad Bin Tughlaq in killing his own father! And with that another curse by Aulia “hunuz dilli dur ast” (Delhi is still faraway) came true! The reason for the unfortunate curses was that Ghiyasuddin called all labour present in the city to work on his fort, including the people who were already working on the water reservoir which was commissioned by Aulia, thereby halting latter’s work. As a matter of fact the fort is illegally (it’s an ASI-protected ticketed monument) frequented by gujjars and others from nearby village, who enter from the rear of the fort. Some school boys were trying parkour stunts on fort’s high walls. Their dangerous attempt was thwarted by our guide who reported them to the guard. As we further drift along the landmarks, we soak in the details and capture narrow doorways, horse stables, mosque, underground passageway flanked by rooms and lamp niches, citadel, palace, and a secret tunnel, in our cameras. 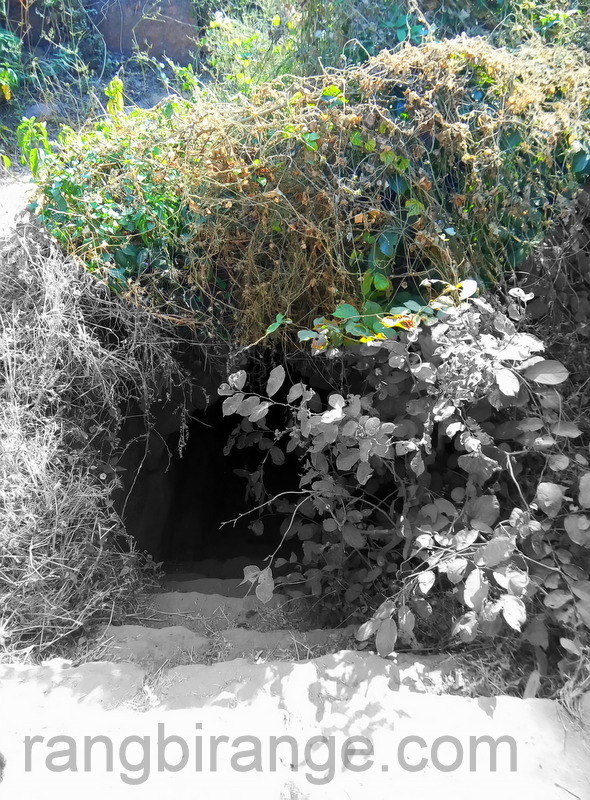 Now this secret tunnel in the fort (towards right from the entrance) had sluice and could have been used as an escape route for the waiting boats at the end of tunnel. Our guide said it is one of the few extant tunnels of Delhi. Treating our group to another interesting tale, the guide told us how the fort came about to be full of piles of copper coins at one point in time. Muhammad Shah Tughlaq’s forced base metal currency implementation resulted in common people minting those coins at their homes to pay taxes and meet expenses. Consequently he had recall both real and fake, resulting in heaps of them encumbering the fort. This story is quite popular in the nearby village. 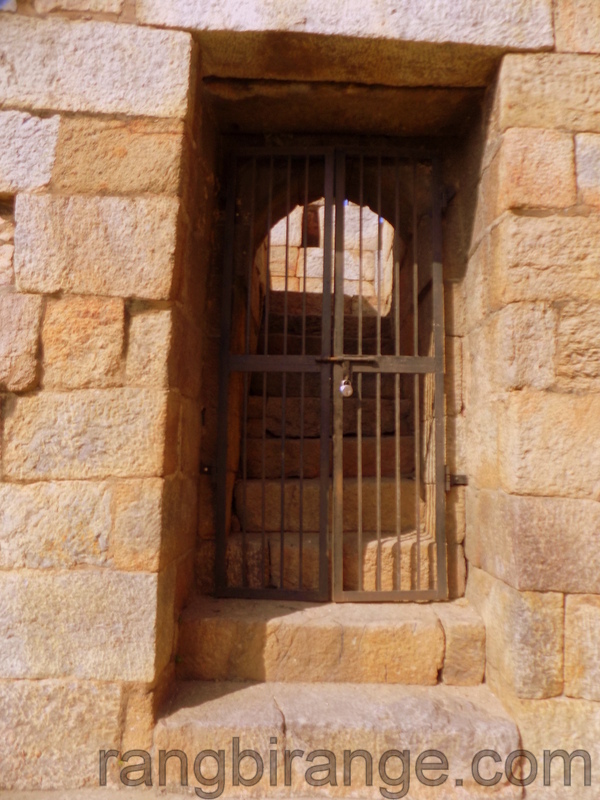 Reaching the highest point of fort, we see the tomb of Ghiyasuddin and his family (wife, alleged murderer son and heir Muhammad Shah ) on south and Adilabad fort on the north. According to ASI the tomb structure was like an island built on an artifcial lake fed by the overflowing of Hauz-I-Shamzi, and connected to the fort by a causeway built over that water body. 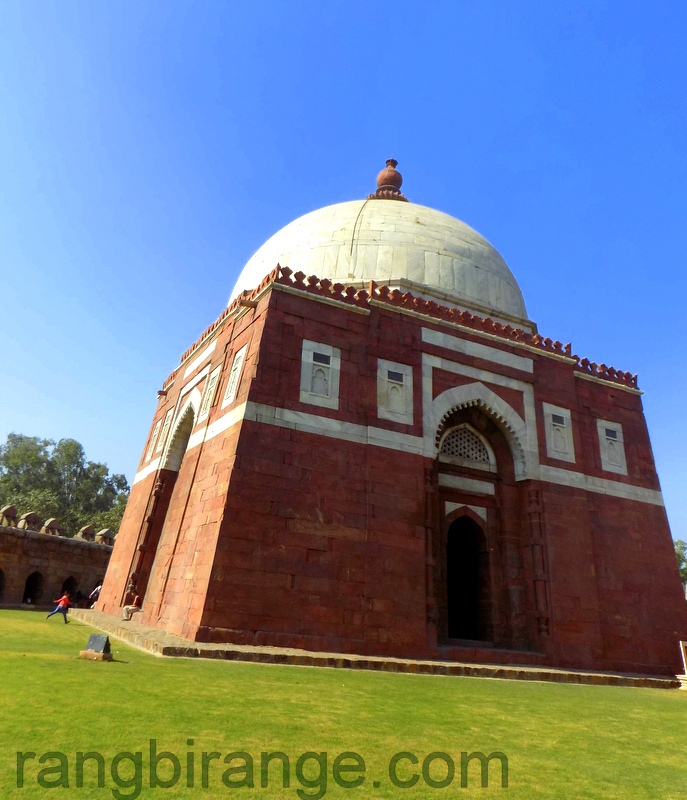 Tomb is made of marble and sandstone having a dome, plain outlines and sloping walls. Its base walls are 11ft in thickness and as they go up, reduce to 4ft. Marble in the inside of dome is unevenly fixed. The alleged murderer son is buried for eternity along with the father. 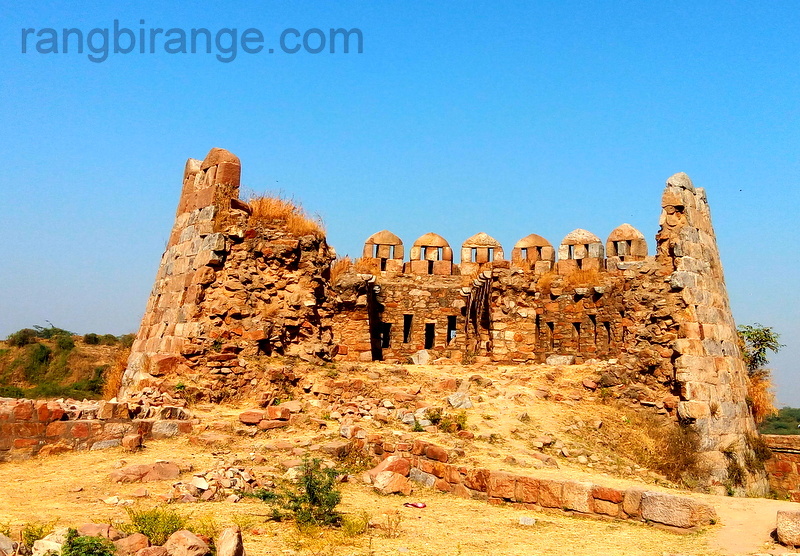 Adilabad also called the ‘fort of thousand pillars’ was built by Muhammad Shah, near Tughlaqabad fort, and connected the two with a causeway. Although smaller, that is considered a more intact example of fortification skills of that time. Metro is the best travel mode to reach this fort and adjacent tomb. The nearest station is Tughlaqabad. From there take a Rs 50 auto ride, as it’s 5kms away. It takes atleast 3hours to discover every part of this humungous fort. Adilabad fort isn’t at walking distance. 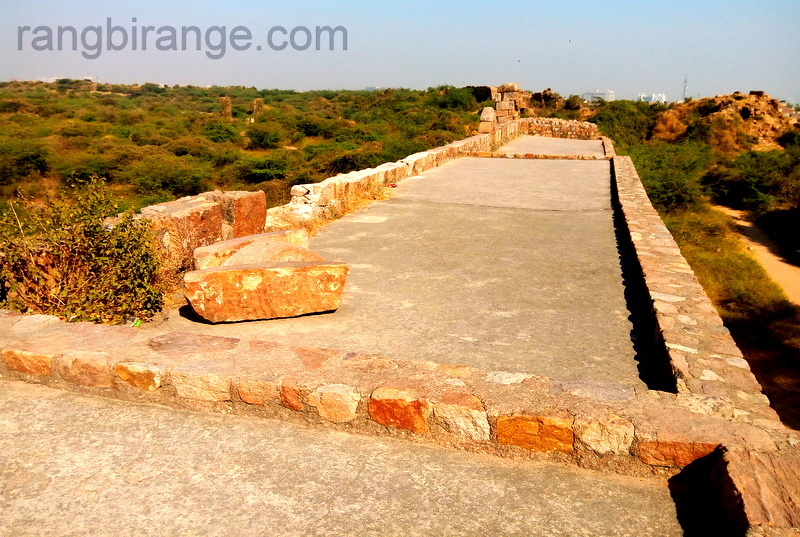 It’s 3-4kms away from this fort. So plan accordingly. There is no car park outside the fort. Sadly it’s not on the must-visit list of most travellers, but one must make an effort to visit this fort symbolising 3rd city of Delhi. Very elaborate. 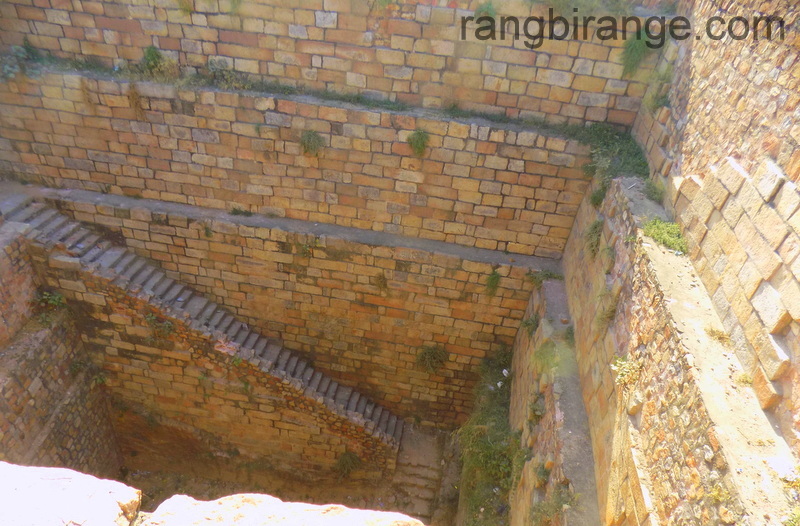 Was there myself with one of the groups some tome back butI thinnk we missed the secret tunnel and the stepwell. Beautiful post.. Delhi s cities have alwats intrigued me.. Should it be possible, would love it if u were to write posts on each of the 7, incpuding Lutyens’ Delhi. I think this post deserves a lot more likes and and a lot more comments !! Good info with beautiful pics. I have been there. Nice to read about it.